I hope that you are enjoying the long weekend. It’s always nice to have an extra day to relax and to enjoy a range of activities, which for me includes baking. For some of you it may mean back to school, which in my case includes memories of peanut butter and jelly sandwiches. Perhaps my thoughts around this time of year inspired me to try a version of Jack Deen’s Peanut Butter & Jelly Thumbprint Cookies that I noticed in the September 2, 2013 edition of People Magazine. I removed the two types of sugar and substituted with coconut palm sugar and honey. I used my cane sugar free brand of strawberry jam, and also tried some with chocolate chips, as the middle garnish. I hope you like this sugar free version of a very tasty cookie. 2. Beat peanut butter, sugar, honey, egg, and vanilla extract at medium speed with an electric mixer until blended. Spoon heaping tablespoonfuls of batter on a parchment paper-ined baking sheet. Flatten dough with a fork. Make a 1/2 inch indentation in the center of each cookie using your thumb. Spoon 1/2 tsp jam (or chocolate chips) into each thumbprint. 3. Bake 12 to 14 minutes or until golden. Makes 12 cookies. 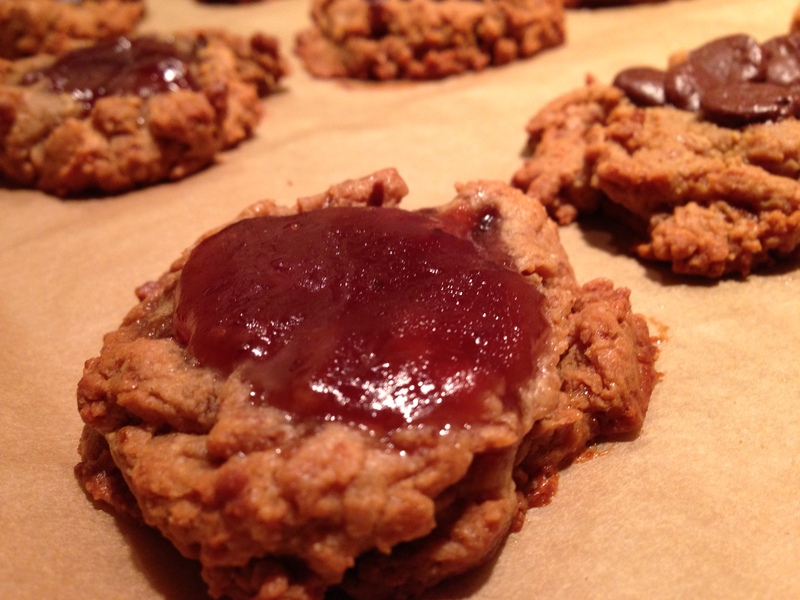 This entry was posted in Economics, Recipes - Dessert and tagged Cane sugar free, Chocolate chip, Gluten free, peanut butter cookies, refined sugar free, Yeast free. Bookmark the permalink. Endanged Species switched to ALL CANE SUGAR in February of this year. Rebecca, thank you for bringing this to my attention! I have contacted Endangered Species for more information and will let you know when I have any other details.